Most proper 4×4 trucks can be driven in axle-deep water without any real issues. When it comes to maximum wading depth, a fair rule of thumb would be about 20 inches. However, deeper water areas such as streams and small ponds need to be be tackled with special precautions. 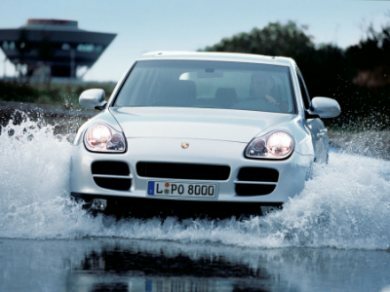 If the water is deeper than 20 inches, you need to know where your engine’s air intake and ECU computer are located, as these should not be immersed in water. Switch off headlights and allow them to cool down, as sudden contact with cold water will cause the glass to crack. Hopefully, if you ventured out at night, you have roof lights installed. Placing a waterproof tarp across the front of your vehicle before entering very deep water will minimize any water entering the engine compartment by creating a “bow” wave, as long as you maintain a brisk forward momentum. The result is less water will be sprayed over the ignition system by the radiator fan and less chance of water entering the air intake. When crossing shallow streams, driving slowly but steadily to create a small bow wave in front of your bumper will reduce the height of the water behind the bumper and keep the water away from the air intake and electronics. Select 4LOW low-range and first gear, while keeping the steering wheel straight. When crossing fast-flowing shallow streams, cross at an angle and try to drive slightly upstream. This presents a smaller perpendicular surface area and lessens the force of the stream on the side of the vehicle. Never cross deep fast-flowing streams, as your vehicle can be swept away. As a final point, apply your brakes several times after crossing water or deep mud to dry them out.